Comment on this report, or find other reports. Our Mystery Worshippers are volunteers who warm church pews for us around the world. If you'd like to become a Mystery Worshipper, start here. The church: St Francis Xavier, New York City. Denomination: Roman Catholic, Archdiocese of New York. The building: Designed in 1882 by Patrick Charles Keely, a self-taught Irish immigrant who designed hundreds of Roman Catholic churches throughout the northeast. Although many of Keely's churches are aesthetically uneven, St Francis Xavier is a grand example of neo-Baroque with Beaux Arts touches. Years of extensive renovation, including what essentially amounts to a gut renovation of the interior, were completed in 2010. 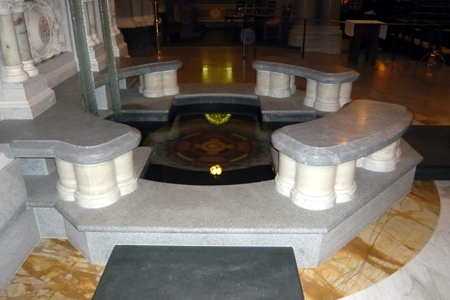 The 19th century altar and reredos have been turned into a fountain, with water running over it into a baptismal pool. All of the frescoes have been restored, and everything sparkles and glistens, with nary a trace of the patina of age. Even the original confessionals weren't left untouched. If I hadn't known it was a Victorian church, from the interior I would have thought it was a modern pastiche on the Jersey shore. 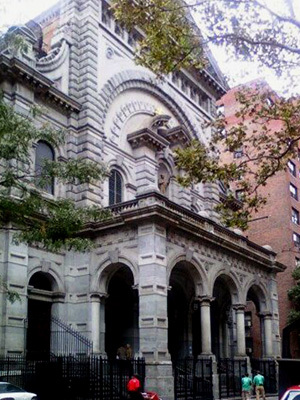 The church: Founded in 1851 by priests from the Society of Jesus, commonly known as Jesuits, it is still staffed by Jesuits today and is the only Jesuit church in Manhattan. Probably the most progressive church in the Archdiocese, they provide a very active ministry to gays and lesbians and are very active in their support of that community, which is not without some controversy. The also have a mission in Honduras, an unemployment support group, training for the disabled, a Zen meditation group, a food bank, and a soup kitchen, as well as a well-regarded high school. The neighborhood: This is Chelsea. The area was developed in the 1930s by Clement Clarke Moore, author of A Visit from St Nicholas (better known as The Night Before Christmas), in what had been his family's homestead. The area has undergone many transformations over the years, from fashionable housing to light industry and now back to quite fashionable, with a significant although graying gay and lesbian population. The cast: The Revd Peter Fink, S.J., associate pastor. The date & time: Solemnity of Christ the King, Sunday, November 19, 2011, 11.30am. Standing room only! The church is very large and it was filled to the gills, pushing 500 I would imagine. I was in the standing room section, which was also the go-to section for moms with troublesome infants. It was pretty busy, as they were packing in a rumbling horde. "As is our custom here at St Francis Xavier, please introduce yourself to those around you." We were handed a bulletin with the musical selections and that was it. They had begun using the new English translation of the Roman Missal early, and had been at it for eight weeks, yet oddly there weren't any missals in the pews, either new or old. I was lost, as was just about everyone around me. Almost everyone just recited the mass they knew. Organ, piano and tambourine. There was a cantor and a large choir in everyday dress. Musically the service was all over the place, with everything from a Taize community hymn and 1970s "singing nun" ditties to hand-clapping African-American gospel and a Broadway-lite mass setting from 2000. I got so lost taking in the restoration that I pretty much zoned out for much of the mass. There were also a bunch of fussy babies, and, well, as everyone knows, when they get going they're pretty hard to ignore. About as evangelical as it gets for Roman Catholics, I imagine. There was clapping and a tambourine during one of the hymns, and during the Lord's Prayer there was hand-holding that quickly led to hand-raising. Also lots of confusion about when to stand or kneel, and it seemed some folks swore off kneeling altogether, choosing to stand even during the eucharistic prayers. 8  Kudos to Father Peter, as it is quite masterful to take one of the most martial passages from Ignatius Loyola's Spiritual Exercises  the passage that invites us to join God's army  and give it such an inclusive, modern reading. He spoke with conviction and feeling and a real sense of humor. He began by calling the new missal "the Grinch that stole Christmas," as with the introduction at Advent, we'll spend all the season learning it. But the new missal should remind us that we are part of a larger community of prayer. Prayer is both action and labor, and part of our own interior struggle with good and evil. It may seem odd today to talk about the kingship of Christ, but if you think about it in more modern rather than medieval terms, it makes more sense. The sermon was packed with lots of nuggets. The insanely insensitive renovation. I couldn't help thinking that the Victorian altar and reredos fountain would have seemed far more at home as a water feature at the Chelsea Flower Show than in a church. Also, some missals would have been nice. And congregations full of well-off white folks attempting gospel songs do so at their peril! There was applause at the end of the service, and I wasn't sure who it was for. There wasn't a postlude, so was it for the organist or the priest? 3  The service was very expansive and their outreach is certainly impressive, but it would be really hard for me to look around every Sunday. Not overwhelmingly so, and mostly my fault. I was having trouble tamping down the sulfurous thoughts about whoever OKd that re-do. Read reports from 70 London churches, visited by a small army of Mystery Worshippers on one single Sunday. Read here.